1 What food vitamins are interesting to prevent or treat anemia? 1.5.1 There are few foods of animal origin that contain this vitamin, except liver, so people with anemia should consume vegetables to obtain it. What food vitamins are interesting to prevent or treat anemia? The deficit of some vitamins can produce or aggravate the anemia. This is the case of anemia due to vitamin B12 deficiency, when not enough food of animal origin is consumed (this type of anemia occurs more in people who follow a vegetarian diet). Other nutrients involved in the metabolism of iron and red blood cells are proteins, B vitamins and some minerals. Although there is no iron deficiency, the lack of some vitamins prevents the use of this iron, as occurs with vitamin B12 and folic acid (vitamin B9). Therefore, eating foods rich in these vitamins will be a way to prevent anemia or help improve anemia. Vitamin B12 is found only in products of animal origin, so it is advisable that vegetarians and vegans are supplemented. All foods of animal origin contain amounts of B12. In vegetarian diets, milk and its derivatives are a good source of vitamin B12 (although we must remember that they are poor in iron). Eggs are also an excellent source of this and other vitamins. 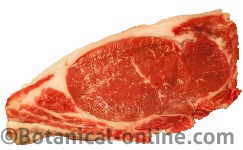 In carnivorous diets, all meat products are rich in B12 (seafood, red meat or fish). Plant foods do not contain vitamin B12 since it can only be made by animals. We can find it in enriched breakfast cereals, and vegetable drinks with added vitamin B12, although one can not assume the daily required doses only with these products. It should be mentioned that algae are not a good source of vitamin B12 and that their consumption can mask a deficit of this vitamin. Vitamin B9 or folates is found mainly in vegetables: spinach is very rich in this vitamin, so it might be advisable to add raw leaves in each salad or tortillas, and eat boiled spinach a couple of times a week . For the oxalate content of spinach (compounds that prevent the assimilation of iron), it is recommended to accompany the recipes with spinach of a little cheese (calcium neutralizes oxalates). 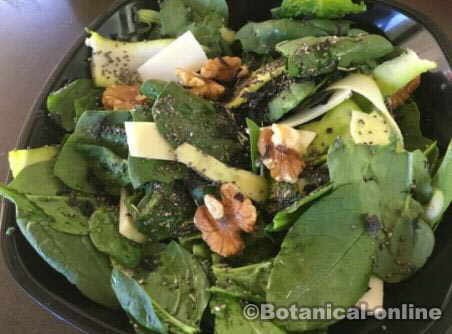 Other foods rich in folates are: boiled Swiss chard, edible wild leaves, such as dandelion or purslane, in fruits such as avocado or forest fruits, and, although in a lesser proportion, in legumes. Purslane is a very interesting vegetable because of its high iron content. Eating citrus facilitates the absorption of iron, because in addition to being fruits rich in folates, they are also rich in vitamin C.
There are few foods of animal origin that contain this vitamin, except liver, so people with anemia should consume vegetables to obtain it.